Our recent publication “Enzyme Prodrug Therapy Achieves Site-Specific, Personalized Physiological Responses to the Locally Produced Nitric Oxide” has been published in ACS Advance Materials and Interfaces. Nitric oxide (NO) is a highly potent but short-lived endogenous radical with a wide spectrum of physiological activities. In this work, we developed an enzymatic approach to the site-specific synthesis of NO mediated by biocatalytic surface coatings. Multilayered polyelectrolyte films were optimized as host compartments for the immobilized β-galactosidase (β-Gal) enzyme through a screen of eight polycations and eight polyanions. The lead composition was used to achieve localized production of NO through the addition of β-Gal–NONOate, a prodrug that releases NO following enzymatic bioconversion. The resulting coatings afforded physiologically relevant flux of NO matching that of the healthy human endothelium. The antiproliferative effect due to the synthesized NO in cell culture was site-specific: within a multiwell dish with freely shared media and nutrients, a 10-fold inhibition of cell growth was achieved on top of the biocatalytic coatings compared to the immediately adjacent enzyme-free microwells. The physiological effect of NO produced via the enzyme prodrug therapy was validated ex vivo in isolated arteries through the measurement of vasodilation. 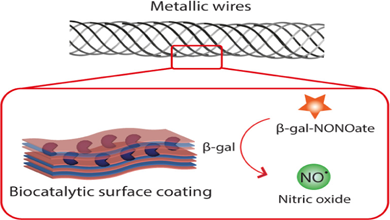 Biocatalytic coatings were deposited on wires produced using alloys used in clinical practice and successfully mediated a NONOate concentration-dependent vasodilation in the small arteries of rats. The results of this study present an exciting opportunity to manufacture implantable biomaterials with physiological responses controlled to the desired level for personalized treatment.